2003 has been designated by Congress as the “Year of the Blues,” and American Routes focuses on two of the genre’s heavyweights: the late Muddy Waters, from Rolling Fork, MS, and the very much alive Buddy Guy, formerly of Baton Rouge, LA. First, a portrait of Muddy from his band members James Cotton, Willie Smith and Bob Margolin, with biographer Robert Gordon. 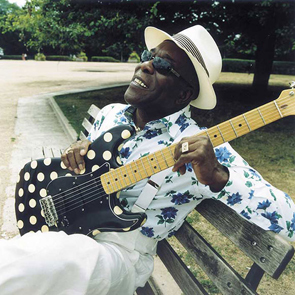 Then Buddy Guy, who played guitar with Waters as a young rising star on the influential 1964 LP “Muddy Waters: Folk Singer,” and who has been regarded as one of finest players of electric city blues for years. We’ll talk with Guy about his extraordinary life, his most recent CD “Blues Singer,” an acoustic tribute to the ’64 Muddy album, and his present-day Chicago nightclub devoted to the blues.